I was in a local café the other day for a meeting. We ordered food, and my crabcakes were frankly, awful. After two exchanges with the staff, I returned it, mostly uneaten, explaining why I didn’t like it. When it came time to pay the bill, I was very surprised to see that they had charged me in full for the uneaten crabcakes. As you might imagine, I didn’t take that news well, and there was a heated, if composed, exchange. His argument was that there was nothing wrong with the crabcakes, which they had been serving for four years without complaint (didn’t believe that for a minute), and my argument was, that wasn’t the point. You don’t want to be sending away an unhappy customer, especially one that is local, and definitely not one who has a reasonable social media following. The new social landscape is littered with hidden mines, one of which could go off at any moment. We’ve all read the headlines and enjoyed the PR disasters, safe in the knowledge that it is happening to someone else. (Check out the United Breaks Guitars’ tale of PR misery here.) But this may not always be the case. Social savvy clients are on the increase. You need to know how to capture their attention, and connect with them in a positive, professional way, to keep them onside and prevent them from reaching for their keyboard to tap out their frustration. 2. Know what you’re talking about – if you don’t know your hashtag from your avatar, then brush up your skills. Enrol in a workshop, get some training, and spend some time in the office with people who are social savvy, watching what they do. 3. Encourage sharing – these vendors could be social ambassadors for you. They are already on the main platforms themselves, and could have a pretty substantial following. One of my good friends (@blogyourworld) has a huge Twitter following. If he decided to sell his house, he has an engaged audience of a size you could probably never reach on your own. Give him interesting, visual content and he’ll be more likely to share it with his following. 4. Stay professional, always – there has been a bit of infighting recently between agents on Twitter. Copying content, making accusations and generally behaving in an unprofessional manner. These exchanges are in the public domain, for all to see. How do you think it makes them look to a prospective vendor? Don’t waste time knocking the competition; instead, focus on the person most important to you and your business – your clients. Make them feel special by creating great content that will help them sell or let their property. 5. Keep your sunny side up – we all have bad days, (even me), but don’t let that creep into your clients’ newsfeeds. They don’t want to hear about your hangover, your car breaking down or your argument with your wife. When you’re on social media, you need to put those feelings aside, and project a happy, positive face of you and your business. A friend once said to me, “there are two types of people in this world: drains and radiators.” Which one are you? 6. Be original – don’t copy other people’s content and pass it off as your own. Social etiquette demands that you credit the other person for finding it, or even for inspiring your post. Social Karma means that what goes around, comes around, and if you credit and thank people, that goodwill will come back to you in bountiful amounts. 7. Be responsive – social media is all about the here and now. When someone makes a comment on your Facebook page, they don’t want to have to wait three days for an answer. I made a complaint to @marksandspencer on Twitter and it wasn’t acknowledged for 12 hours. 12 hours!! In Twitterland, that’s a lifetime. And during that period of time, I had 10,000 Twitter followers reading my evermore frustrated tweets and retweeting it to their audiences… that’s a lot of social damage for a brand. Even if you have a negative comment, in fact, especially if someone leaves a negative comment, deal with it quickly, professionally, and make them look good, not you. 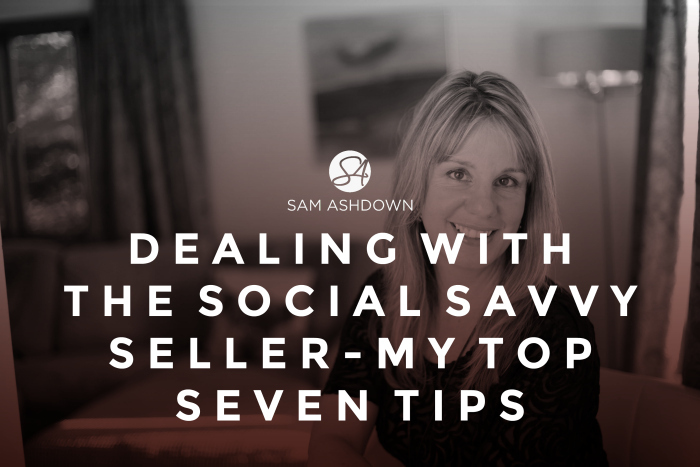 A social savvy vendor can be your biggest asset, or your most dangerous liability. I had a really positive email exchange last year with a lady from London, wanting to sell her ‘flat’ there. Turned out the ‘flat’ was a £2 million apartment in Kensington, and the lady in question was a property journalist with 30,000 Twitter followers and some pretty powerful connections. Get your social personality wrong, and you could be at best, wasting an opportunity, and at worst, making a huge PR mistake. Get it right, and you could have some pretty heavy social hitters on your side, and that could be a huge boost for your business. If you want to know how to use social media to woo more vendors and landlords, you will love my workshops. I’m running several over the next few months, so if you’d like to be notified when I’ll be in your area, send me an email to sam@samashdown.co.uk and I’ll add you to the notifications list. Previous post What gets you out of bed in the morning?